Every time I get close to some financial milestone, or my finances change in some way (bonus, raise, etc. ), I go to my copy of YouNeedABudget (my favorite budget tool) and see how I’m doing. Sure, I look at it way more often that that. Every day, actually, because I am constantly putting in my purchases and expenses to track how I’m doing against my budgeted amounts. I’ll leave my budgeting philosophy to another post; here, I want to see how I’m doing against a guru of personal finance, Dave Ramsey. Dave is a great guy who has helped a lot of people; this is NOT a criticism of him or his approach to personal finance. OK, so not quite the same! But sometimes there’s more than just general categories at play. Let’s take a look in depth at each category to see where the difference is..
Charity – This one is easy; I don’t contribute to charity per se. I do random acts of kindness and I participate in different charitable activities that my company sponsors, but I do not regularly contribute to a charity. Savings – Here is where I think my definition of savings is perhaps different from Mr. Ramsey’s. My Savings category includes the following: emergency fund (up to six months of expenses), short-term needs (clothes, household stuff, etc. ), medium-term wants (vacations, semi-large purchases such as a new computer or camera), non-401k retirement (Roth IRA), and long-term savings (car replacement). 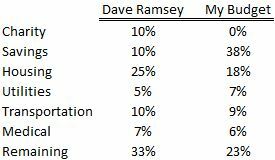 I’m not sure what Dave has in his savings categories; I suspect many people who follow his program can’t even think about these things. Or, maybe he accounts for them in his Other category. Regardless, I have four separate savings categories in my budget. Housing – This one is pretty close. It really depends on whether you rent or pay a mortgage. I’m a renter for several reasons, not the least important being I don’t know how long I’ll be in my current location, and buying is not a good idea when you’re in that position. If I were to own property, my housing expenses would include mortgage, homeowners insurance, property taxes, any homeowners association fees and a general maintenance fund. I would keep the maintenance fund as a housing cost, not in savings, because if I didn’t have a mortgage I wouldn’t need to save for those expenses. It exists purely because you pay a mortgage; therefore, it’s a housing expense. Utilities – I’m a bit more that what Dave suggests. My utilities include cable/internet and cell phone. My girlfriend pays the electric bill (usually very close to the cable/internet bill), and my apartment complex does not charge extra for trash, water, or gas. In Memphis, MLGW is the entity that provides electricity, gas and water, so it’s all one bill. Easy enough. BUT! While I pay the cell phone bill, I actually split it three ways, with my mom and my sister also on my plan. I pay the bill, they send me their third of the bill. I don’t account for what they send to me and consider the bill fully mine. I classify what they send me as extra income for the month, and put it into savings. Maybe not the most honest approach, but if they couldn’t pay me, I would still need to come up with that money, so I put the burden fully into my budget. Medical – I am lucky in that my employer offers a very good health and dental plan, and I don’t have to pay much out of pocket usually. I still put 5.5% of my salary into a budget line to account for any and all out of pocket expenses I may incur, up to the point where my deductible is fully paid for. This gives me peace of mind, just in case something crazy happens and I have higher than expected expenses. I’m still within Dave’s parameters, though. As I age, I’m sure I’ll want to contribute more to this, but for now it seems to work. It accounts for what I spend, while building up a balance just in case. Other – Not sure what Dave accounts for here. He has this portion as 33% of the budget, while mine is at 23%. But, unlike Dave, I have specific uses for this money. My “Other” category includes my gym, groceries, entertainment funds, personal care (hair cuts, shampoo, etc.) and some spending money. I also include my student loan payments, which combine for 10.6% of my monthly salary. I believe any debt would fall under this category in Dave’s budget as well, with his recommendation to use what remains in your Other category to pay it off. I’m focusing on building up savings at the moment, but I’ll begin to move a portion of what’s in my Savings category over here to pay that debt down faster. So there you have it. In a general sense, Dave’s percentage-based budget is pretty close to what I have, with just a few differences of opinion or definition. It’s a really common-sense approach, as well, because it can scale up based your current income. But, one criticism I do have of it is that the scaling factor doesn’t work as your income rises. Instead, any raise you get should be metered out to your Other or Savings category. If your monthly salary goes from $3k to $5k a month, does that mean you should spend $500 a month MORE on housing? I would argue, not necessarily. If your housing situation is not good based on your current income, and you get a raise or a higher salary, then it may be prudent to spend the extra money. Otherwise, I think it’s a good approach to budgeting in the immediate term. What do y’all think of his budgeting approach? This entry was posted in Personal Finance and tagged budget, Dave Ramsey, personal finance by JB. Bookmark the permalink.